What Size Hail Is Damaging to Roofs? Are All Homes in One Neighborhood Affected the Same Way by Hail? My Roof Is Leaking, But I Just Had New Shingles Put On Last Year – What Could It Be? How Hard Is It to Repair a Leaking Roof? Should I Have the Old Roof Removed Before the New One Is Put On? How Long Does it Take to Replace or Repair a Roof? Does the Wood Beneath My Shingles Need to Be Replaced? How Can I Choose the Right Roofing Contractor? That can depend a few things. How brittle your shingles are and is there any internal issues such as a leak. Those are just a couple of things we would want to see before set a game plan. That can vary by the age, height, steepness, layers of shingles and the severity of the issue. But those are all the factors that come into play when pricing a repair. The more risk ie- height and pitch of a roof combined with 2 layers tend to cost more then a one story walk on roof. We check the gutters, siding, soffit and facia for signs of damage or wear and tear. On the roof we look for layers, Ice and water shield, drip edge and gutter apron, check all flashings, ensure pipe boots are sealed properly and in good shape, check skylights. Look for loose shingles and or nail pops. Exposed nails and rotting trim. The over all condition of your roof, Piece of mind, if there are any issues then clear next steps to be taken to rectify the issue. Does it make sense to get the insurance company involved? The majority of the time I have found that unless you have some knowledge about the products and installation processes for what ever DYI project. I would have a professional take care of the project. There are a few factors that play in our midwestern climate. Sun and Heat, Rain and Wind, Freezing temperatures, snow and ice. On top of that what type or style of roof do you have? Is it flat or is a steep pitched roof, does it shed water well or does it sit in the gutters? 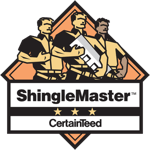 What type of shingles and underlayment do you have and also proper ventilation is very important and is widely not understood or installed correctly with the life of the roof in mind. We can explain all of this in person during or after our inspections. Lack of or poorly installed ventilation, to many layers on a roof are the two big ones besides weather and climate changes. Almost any size can damage a shingle, soft metals as gutters and down spouts, skylight claddings and metal vents on the roof. Not always. It can hit one street for a few homes and skip others. That is why it’s good to get a local (not a storm chaser) expert to take a look. The Attic is the best and first place to start. Unfortunately, that does happen from time to time. It’s important to use a reputable company that will offer a workmanship warranty or will do the right thing. In some cases, it truly could be an act of god like ice damming. In those cases, there is not much you can do. Depending on how extensive the damage is. If it’s not much then it should be easy. I’ve had cases where we have had to rip off an entire side of a home replace decking (due to bad ventilation and a poorly located skylight) and still be done in an afternoon. Yes. Every time. In our area you can have up to two layers legally. You save some money by doing a lay over but if and when the roof needs a repair or replacement it will cost you that much more. All you are doing is waiting to pay at a later date or you are going to cause someone else an expensive headache down the road. We have completed 80 square roofs (8,000 square foot homes) in two days. I would say a 40 square roof give us one to two days. We use a synthetic instead of the old easily to tear and rip tar paper. It is very durable and is much safer for the roofers to walk on so there is less of a chance for someone to fall and get hurt. The one thing to remember about underlayment is it moves with your house as it contracts and expands about 6” every year. We also use Ice and water shield on the eaves valleys and if code calls for it we will two layers on the eaves as to be 18” inside the warm wall, up the rakes and on the ridges and penetrations. This can help prevent ice damming. If we tear off and find the decking will not hold nails we will need to replace that decking. In some cases, we have been able to get the insurance to cover that cost depending on your policy. At a minimum you should get a GAF 50-year lifetime roof. That has dimensional shingles, ice and water shield, drip edge, gutter apron, ridge vent, new flashings. That can depend on the style, aesthetics and function you are going for. We would be happy to explain that further in person. In this day and age, the power of information at your fingertips I would get on the google machine or Angie’s List or Home Advisor. The last two websites that have been around for a long time and are based on home service providers. Also, unlike some of the other and old places people would check for references you cannot pay those two sites to remove bad reviews. I believe it’s important to have a face to face next so you can see if like them.